Research Credit: Oxford Bilingual English - Italian Dictionary 2012. Alla = With ( Note: ALLA denotes what the dish is served with; for example: Melanzane Alla Parmigiana Siciliana means Eggplant baked and served with melted Parmesan cheese in Sicily. Alla means the product used in the dish, and it does not have to be from the Designation of Origin region it is used. 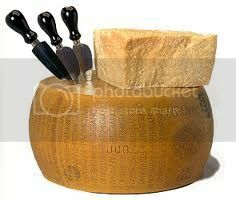 Parmesan cheese is from Parma, Emilia Romagna in north central Italia. 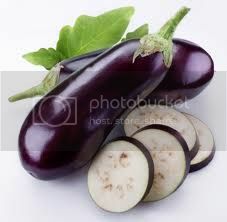 The eggplant dish is renowned in Sicily and eggplant is a basic vegetable grown in: Sicily, Lecce - Puglia ( Adriatic heel of Italy), Basilicata and Reggio Calabria, the toe of Italy ). 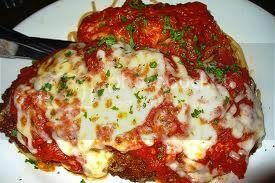 Parmigiana = a baked dish using Parmesan and other cheeses on top of the product, for example: chicken, veal and eggplant and melting the cheese. Parmigiano Reggiano = Government Designation of Origin cheese, Parmesan Cheese produced in Parma, Emilia Romagna, Italy. This cow variety cheese is often called Parmesan in English speaking countries. Pecorino Sardo = This powerful tasting ewe milk aged cheese is often called Fiore Sardo and the majority of this variety of cheese is produced on the island of Sardinia. 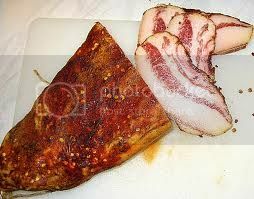 Peperone = This is not charcuterie. This word translates in Italian to the vegetable Bell Pepper. 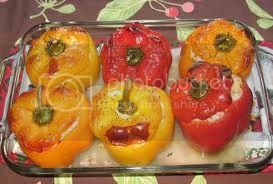 Peperoni Ripieni = Stuffed Bell Peppers. Spigola in English is Sea Bass, a predominately used fresh catch daily in Italia. Sogliola is Sole in English. Rospo is monkfish or angler fish. Tonno is tuna, which is very popular in Reggio Calabria and Sicily. 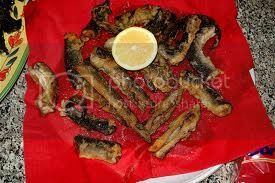 Calamaro is calamar or squid. Astice is lobster which is very popular in Sardinia. 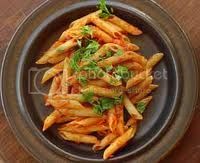 Penne All´ Arrabbiata = A Macaroni variety with a sauce made of: tomatoes and chili peppers. 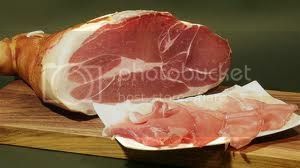 Proscuitto di Cotto = this is cooked Ham from the town of Parma. 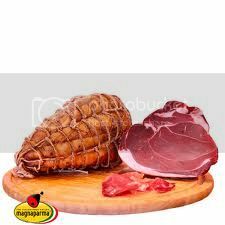 Culatello = a 300 day old cured Salami made from the heart of the hind legs of the pork. 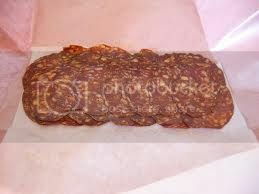 This salami´s secret to phenomenal taste is, it is soaked in Emilia Romagna local white wine first. This product has been endorsed by Chef Mario Batali. 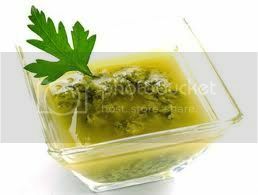 Salsa Verde = This Green Sauce is prepared with Green Olives, Capers and Herbs and is very popular in Bologna, Emilia Romagna. As a matter of fact, Chef Mario Batali has it on his cartes. 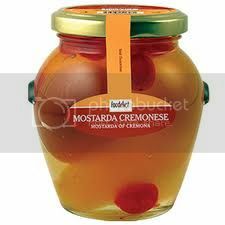 Mostarda = This is NOT the false friend, of the word Mustard. Mostarda is a slightly sweet jam - jelly like sauce made of Quince, Unripened Green Pear and Mandarines and is reduced in an emulsion. It is very popular in Bologna. Bollito = This is a Bologna, Emilia Romagna rural slowly simmered traditional stew made with Tongue, Veal, Sausages and Capon. Guanciale = Pork Cheeks. 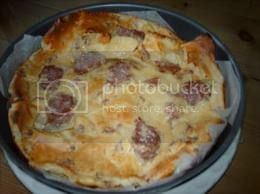 A common dish in Emilia Romagna. 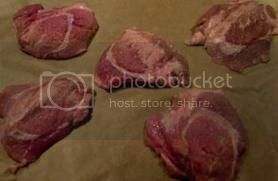 Guanciola = Veal Cheeks. A popular dish in Emilia Romagna. Farro = An ancient ancestor of modern Semolina Wheat strains from the region of Lecce, Puglia. Sussumaniello = an indigenious red grape dating back to the Greeks, superb and supple, winemakers are launching it into the export market. D.O. Southern Apulia as we are here. Negroamaro = a dark dark black cherry grape, used for making local rustic red wines in Puglia. Its Designation of Origin: Southern Apulia. 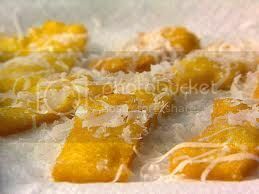 Polenta = yellow cornmeal which can be baked and served in slices or simmered in Porridge or fried. 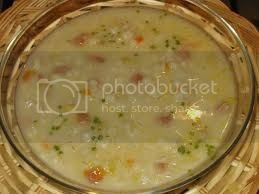 Cacciatora = a food product prepared in a white wine and mushroom sauce. 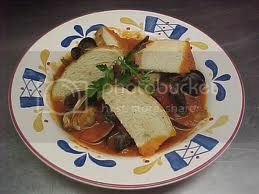 Chicken Cacciatora is a well known dish in this genre. 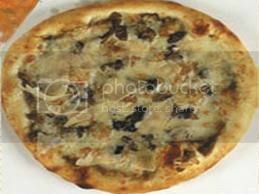 Pizza Caprichosa = this is a pizza with the following ingredients: artichokes, mushrooms, Proscuitto di Parma and mushrooms. 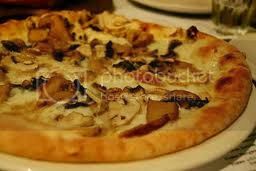 Pizza Campagnola = Pizza prepared with mushrooms and bell peppers in Napoli, Campania. 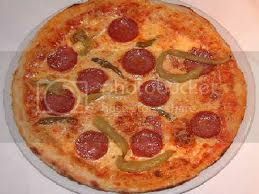 Pizza alla Diavola = this is pizza with spicy piquant salami as the word diavola signifies diabolically piquant. Pizza al Quattro Formaggi = this is a pizza with 4 cheeses; gorgonzola, bufala di mozzarella, Reggiano Parmigiano and Latteria Grana. Pizza al Porcini = this pizza is made with Boletus Eduli called Ceps in English and Catalan, a wild variety of autumn seasonal mushrooms. 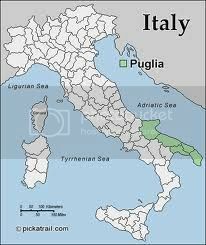 Puglia or Apulia = is the 70km southeastern Adriatic coastal, region steeped profoundly in Greek history, covering the heel of the boot. Picturesque Puglia, is well worth a visit. The rugged cliffs and rural terroirs, the 70 km of Adriatic coast with white sands, and the lure of the Grottoes ... the charm of the old historic towns, the cobblestone streets and the old Fortresses. The potters and woodworkers ... just enchantment meets you and your travel partner every step you shall take. Italia bakes approximately 360 different types a bread. Here are the most popular Apulian varieties. 1) Focaccia Ripiena = this heavenly rectangular focaccia is filled with Mozzarella, Proscuitto, tomato, leeks and / or onion and is baked in oven. 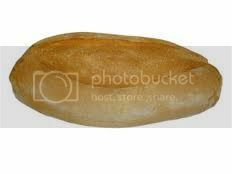 2) Puccia di Pane = a lovely small light olive bread, oval in form, is made with semolina in the comarcas, or regions of Lecce, Brindisi and Ostumi, Apulia. 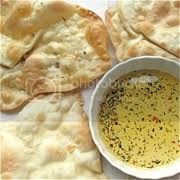 It is commonly served warm and on the side, to dip into EVOO and a variety of salts. 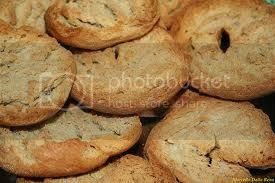 3) Pane di Attamura = a hard crispy flour yeast variety with compact crumbs and a huge circular shape. 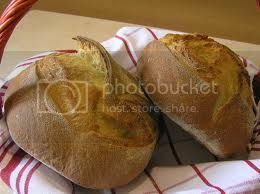 4) Pane Casareccio = This ancient Roman bread is made of wheat flour, yeast and water and is rustic on exterior with a country baguette loaf appearance. 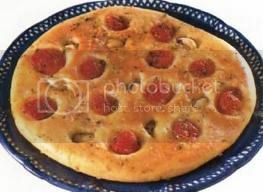 5) Puddica = this is a round bread similar to a torta in shape and it is dressed with oregano, potato with tomato and herb filling and EVOO. 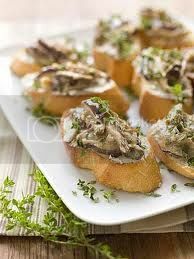 6) Crostini = are similar to huge canapés, topped with anchovies or tuna, roasted red bell pepper and olives. 7) Friselle = this is an Oat and Wheat blended round loaf with a very crispy exterior. 8) Taralli = this bread is prepared with the following ingredients: 500 grams of all purpose flour, wheat or white; salt and pepper, 125 grams of Pork lard called Manteca de Cerdo which looks like vasoline; 55 grams of Beer Yeast, EVOO, water and Fennel Seeds. 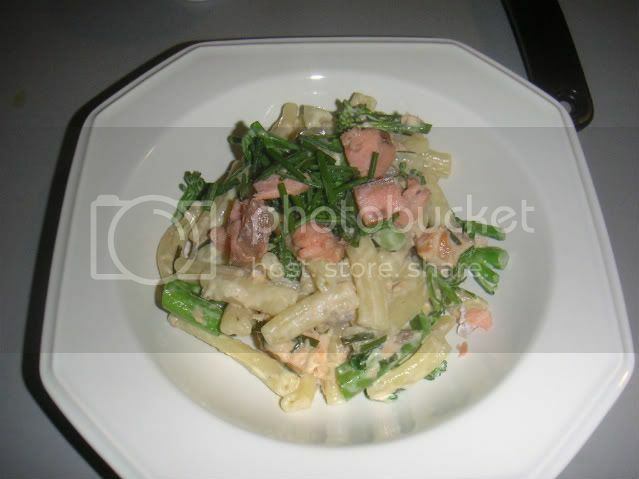 Trout = trota in Italain, this variety has salmon colored thick flesh and is prized in numerous dishes. 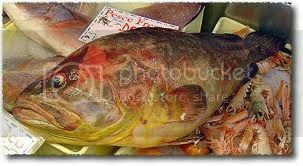 Perch = Pese Persico is a lake variety, employed in fillets, and known for its white flesh. Sturgeon = Sturione, is used in small quanitites however, favored in a caviar roe topping. Its fillets are appreciated in Batter. 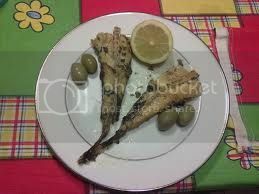 Temolo = is a small indigenious fish with a light delicate flesh and served ina antipasti. Coregonne = 30cm, long on average, this variety is valued by Chefs for its possesses a very fine delicate taste and texture. Veal Scallopine al Limone: this Milan classic is prepared with : veal or chicken, lemon, white pepper, Evoo and butter. Ossobchialla Milanese: Milanese signifies Mian, Lombardy. The ingredients of this common historical dish are: butter, veal in Osso Buchi cut ), dry white wine, salt and pepper, chicken stock, tomato, ham, carrot, onion, parsley, lemon juice and celery. 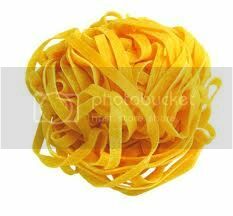 Tagliatelle = thin, flat ribbons of egg pasta. 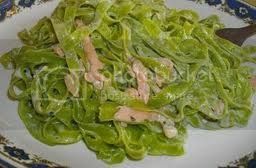 Tagliolini Verdi = a very thin green noodle shaped pasta. 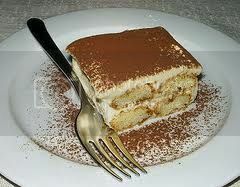 Tiramisù = a Milanese ( D.O. Milan) Italian dessert made of espresso coffee soaked sponge, eggs, Marsala wine, mascarpone sweet cheese and chocolate shavings. The expression Tiramisù translates to: Pick Up and Energize. 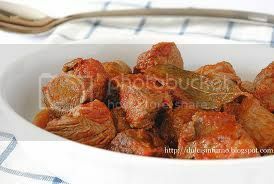 Spezzatino di Maiale: This is a pork stew prepared with rosemary, garlic, Evoo, chili peppers, ripe tomatoes and pork in the Basilicata province. Acquasale: This is a classic Basilicata salad made with onion, Evoo, garlic, chili peppers, day old bread croutons and black pepper. The liquid ( acqua is water ) is from the scalded tomatoes which is the broth in which the salad is served. 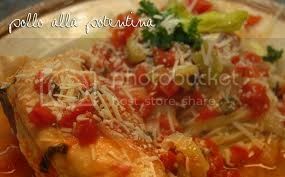 Pollo alla Potentina: This dish is a stove top classic sure to please served in southern Italia. The ingredients include: chicken, 300grams of ripe tomatoes, 30grams of butter, 1 onion, 350Ml. white wine, chili pepper crushed in a mortar, 1 tblsp of parsley, 50 grams of grated pecorino or ewe cheese. 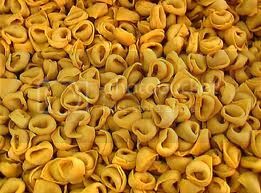 Tortellini di Magro = a semolina pasta filled with cheese, parsley and spinach or other vegetable. 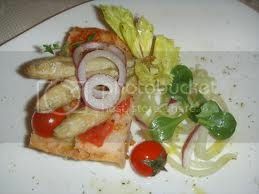 Pizza Pugliese = This pizza is common in the Puglia province and it houses the following ingredients: tomato and onion. Pizza Napoletana = the origins of pizza hail from Campania ( Napoli or Naples ) on the western coast of Italy, and thus, a Napoletana Pizza is: tomato, bufala di mozzarella and anchovies. 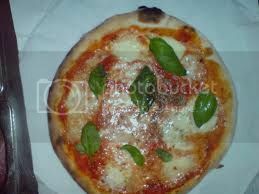 Pizza Margherita = this is a pizza with: tomato and bufala di mozzarella. 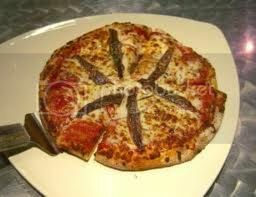 Pizza Siciliana = This pizza includes: anchovies, capers, olives and oregano. 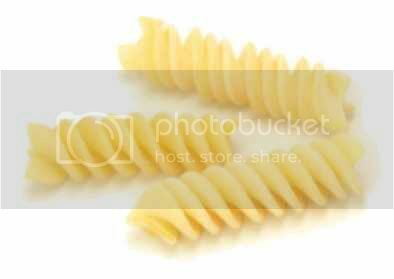 Fusilli = a small to medium sized spiral pasta variety used in numerous dishes and pasta salads. 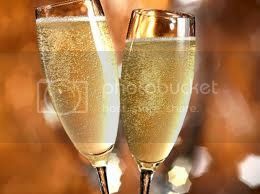 Spumante = a sparkling wine, like Cava. 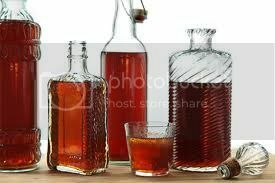 Strega = a strega is a witch and an Italian sweet cordial and liquor. 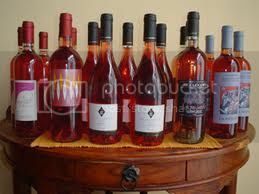 Vino rosato = rosé wine. Vino Rosso = red wine. Vino Bianco = white wine. 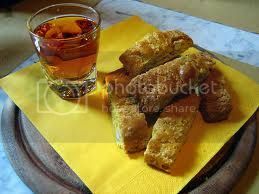 Vin Santo = a Tuscany Designation sweet wine used predominately in dessert making. 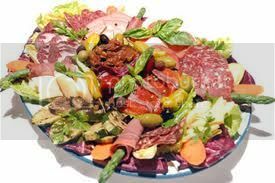 Antipasti = assorted starters, sort of Meze and can include: cheeses, olives, seafood, charcuterie and Proscuitto di Parma. 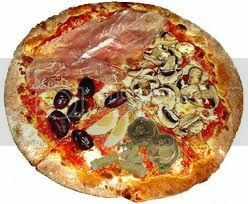 Pizza alla Napoletana = tomato, anchovies, bufala di mozzarella, oregano and olive oil are the ingredients for this pizza. Calzone = is a stuffed pizza which is commonly prepared in Sicily, Basilicata and Reggio Calabria in southern Italy. Common fillings include: tomato, ricotta, bufala di mozzarella, salami, basil, parmesan cheese, ground beef or ground pork and vegetables. 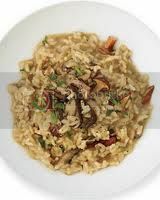 Risotto = A rice variety from Lombardy which is one of the most important crops of this northwestern region. 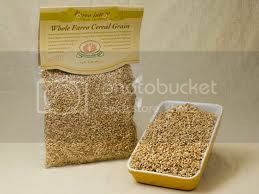 The Arborio or Carnaroli varieties are short grain and are much creamier than rices grown elsewhere. 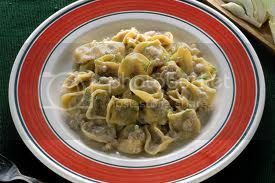 There are uncountable Risottos which are based on other seasonal products; vegetables, Proscuitto di Parma, cheeses, chicken, meats, game, fish, shellfish and seafood. 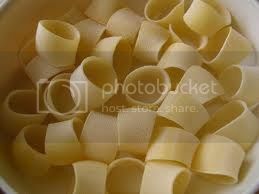 Anelli = this is a small ring shaped pasta. The word anelli is ring in Italian. 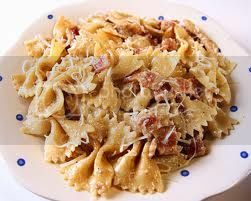 Farfalle = This pasta variety comes in the form of a butterfly and / or a bowtie. 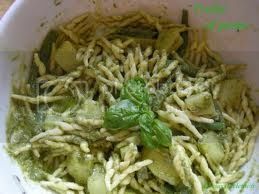 It is very popular in pasta salads and with children. 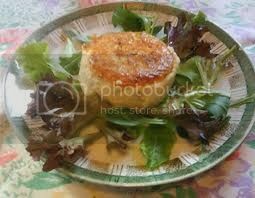 Timballo al Gorgonzola = this dish translates to Rigatoni with Gorgonzola, a fine Italian Blue Cheese. ( see: The Great Cheeses of Italy in the Cheese Section ). This specialty is created in the oven and includes the following ingredients: milk, fresh Baguette bread crumbs, Rigatoni or Penne Pasta and Parmesan Cheese, and the macaroni is baked. Smacafam = the name of this dish signifies " the hungry killer " and the origins of this specilaty hail from Trentino Alto Adige in northeastern Italia. The translation is Yellow Cornmeal, Polenta with Sausage & Asiago Cheese. Involtini di Vitello con Pecorino e Aceto Balsamico = The translation is, Veal Rolls with Pecorino Cheese and Balsamic Vinegar. 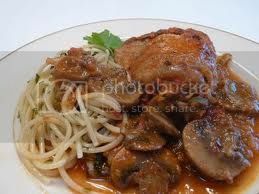 The Scallopine shaped veal is rolled filled with ham and cheese and rolled and then, sautèed in both olive oil and butter. This dish is traditionally prepared in white wine. 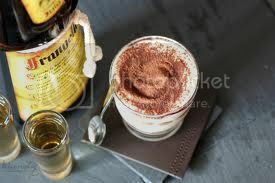 Sambuca = is an anise cordial very popular with Espresso after lunch or dinner. Amaretto = this is a bitter almond and apricot accented historical Italian liquor. 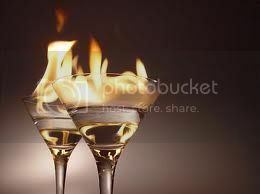 Frangelico = is a hazelnut cordial. This is very popular with Espresso. 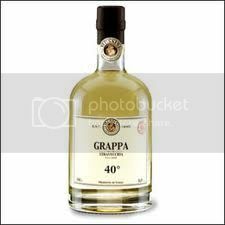 Grappa = a fiery clear brandy distilled from remnants of wine grape pressing. 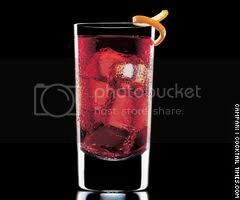 Campari = this liquor had begun production in the 1860s. It consists of bitter orange peel and bitter spices, and aides in dizziness and stomach ailments. It is commonly drunk as an apertifi with club soda or sparkling water and lemon or lime. 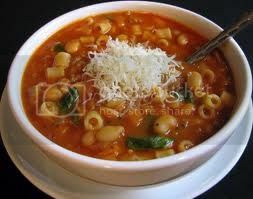 Pasta e Fagioli = This is a hearty Veneto region thick soup with: chickpeas, olive oil, butter, onions, tomatoes, garlic, cayenne or chili pepper and small pasta called Orzo or Acini di Pepe. 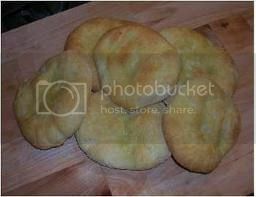 Carta di Musica = Sardinian Crisp Bread is an unleavened thin crisp and round flat bread which resembles a music sheet. 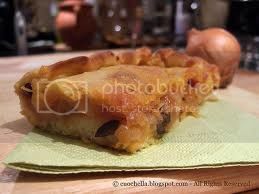 It is made from: whole wheat flour, semolina flour, salt, water and olive oil. 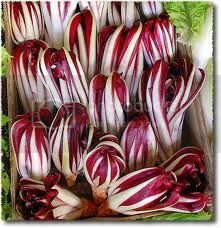 Radicchio = This magenta red violet lettuce variety is indigenious to Veneto, Italia. It is slightly bitter and pairs wonderfully with Arugula, a green field green which is also slightly on the bitter side. 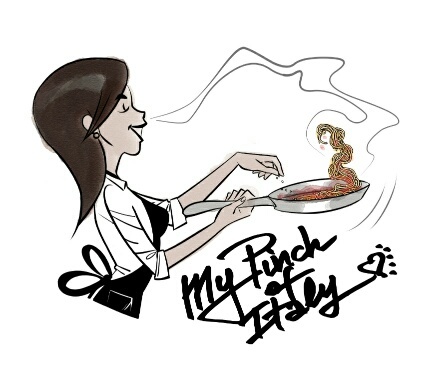 Other matches made in heaven are: anchovies, endive, Reggiano Parmesan and / or Pecorino, E.V. Olive Oil and vinegar of choice. 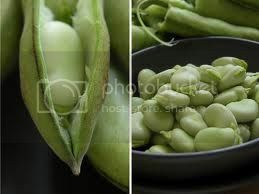 Fava Beans = this is a legume from the Liguria in northwestern region of Italy. They are paired with pastas and potatoes. 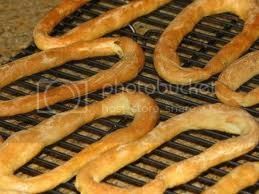 Trofie = A twisted noodle pasta variety from Liguria. 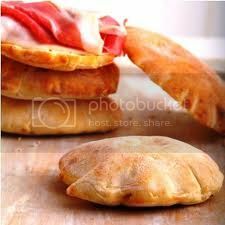 Focaccine = a Liguria dessert, in form of a small dough pillow, stuffed with sheep cheese and fried. 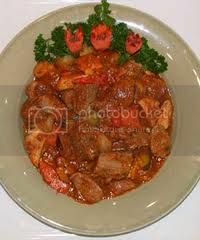 Spezzatino di Vitello al Rosmarino = veal stew with rosemary, is a stew and mainstay of the Friuli region in northeast Italy. 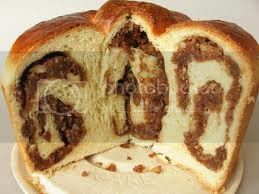 Gubana = this famous northeastern, Friuli region dessert is made of dried fruits and is similar to a nut strudel. The other ingredients include: almonds, currants, brandy, pine nuts, apricot preserves, eggs, grated orange peel, breadcrumbs, eggs and dried figs. Bagna Cauda = garlic and anchovy dip. 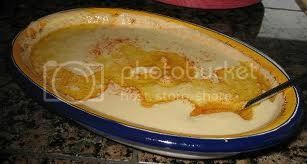 This dip ( salsa ) is a warm dip made of: melted butter, anchovies and garlic and Bagna Cauda signifies " Hot Bath". Enjoyed by people who use it to dip assorted raw vegetable crudities. 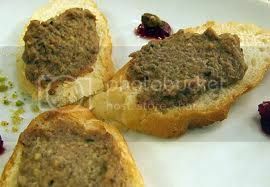 This is commonly served in Piamonte in northwestern Italia. 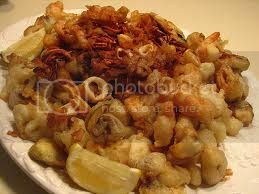 Fritto Misto = an array of assorted fried appetisers. 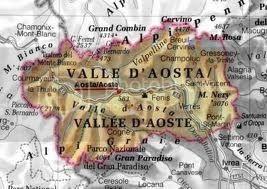 Antichissima tartrà = a Piamonte region souffle with black truffles. Paté di Fagiano e Beccaccia = Pheasant and Woodcock Paté highly enjoyed in Piamonte. 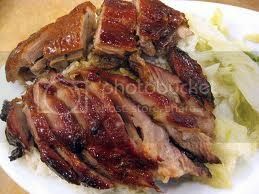 Germano = wild duck, a very common game dish in Piamonte during the autumn predominately. Cernia = Grouper fish, a Sicilian visitor to its shores, is plentiful in daily catches. 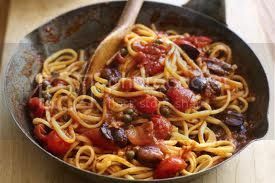 The specialty for this dish, prepare it with capers, black olives de-seeded chopped tomato, E.V. 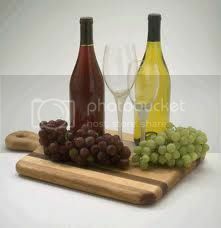 Olive Oil and white wine - grilled simply whole with a pinch of salt and fresh herbs or oven baked. Spaghetti Carbonara = spaghetti prepared with butter, pancetta, garlic, pecorino sardo, egg whites and / or egg yolks and Reggiano parmesan cheese. 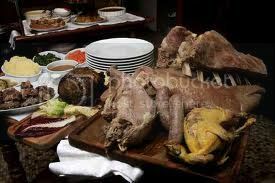 There are as many variations to this recipe as there are restaurants and families, each preparing as their forebearers had before them. Linguini alla Puttanesca = this dish was developed by Mr. Sandro Petti, a restaurateur on the island of Ischia, off Napoli in 1950. 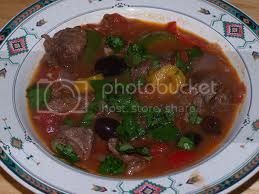 He created the dish for his late night dinner guests, the neighborhood Puttanas ( whores ) who he felt kinship to and it is made with: anchovies, black olives, capers, butter, olive oil, tomatoes, garlic and parsley. 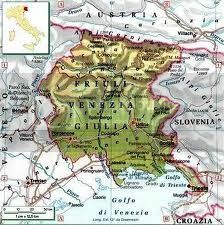 Friuli Venezia Giulia = this historical region, on the frontier of the Old Yugoslavia in northeast Italy, is the home of Prosecco, legumes, charcuterie, gulasch, strudel, corn for polenta, sausages, pancetta and dairy. Salsicce Al Vino = sausage with wine. 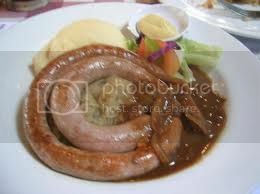 This dish is normally prepared with white wine, white wine vinegar and sausages hand rolled from this region. 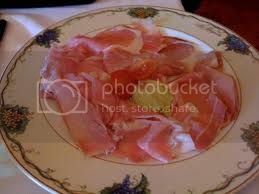 Proscuitto di San Daniele = Ham with fresh Figs. This is a lovely combination of the savoury and the sweet. 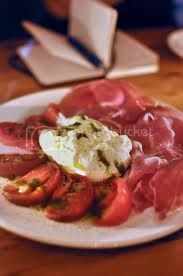 It is a very popular appetiser or meze in an antipasti. Coda di Rospo al Vino Blanco = Monkfish with white wine. This dish is simply prepared with: flour. garlic, onion, rosemary. white wine and E.V. Olive Oil. The fish is simply breaded and sautèed. Anguilla Fritta = Fried Eel. Eels are available in cans and they are served with olive oil, lemon and breaded and sautéed lightly in olive oil. They are a delicacy in the Mediterranean and can be quite costly fresh. However, there is a large canning industry. Presniz = a bread like stuffed pastry with walnuts, hazelnuts, almonds, raisins, lemon juice, butter, flour, sugar and sugar dusted top, historical to this region Friuli. 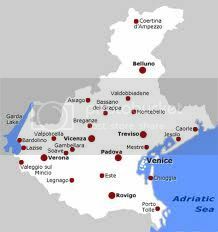 Veneto = located in Norteastern Italy on the Adriatic, where Venecia, one of the most enchanting and romantic cities in the world had played one of the greatest roles in the navigation of the East Indies and beyond. Furthermore, Veneto is the home of the slow cooking movement and hand blown glass. Some of the most famous dishes here are: Beef Carpacchio, radicchio salad, pasta e fagioli, Adriatic daily catch, Risotto of the region, and anchovies. Carpacchio di Ciprani = Carpacchio of Ciprani. 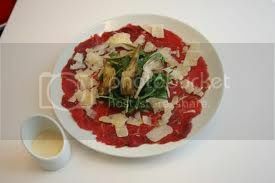 Italy has highly prized veal and thus, Carpacchio is part of Italian culture. Both the veal and the beef varieties are served throughout this region. 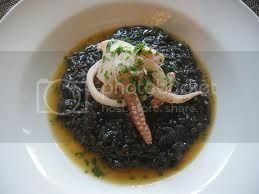 calamari, ink sacks, garlic, lemon juice, white wine, fish stock, parsley and Risotto Vialone Rice. Minestra D´Orzo = this is a barley soup with sausage common in the rural areas of Veneto and influenced by the Trentino Alto Adige province. The ingredients are: kielbasa sausage, beef stock, peral barley, caroot, onion, celery, green cabbage and herbs topped with Montasio, an aged provolone cheese. 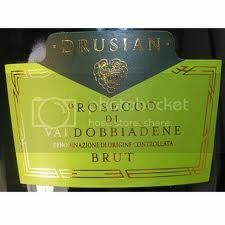 Prosecco di Valdobbiadene: A truly light elegant dry white sparkling wine with a Designation of origin called a Denominzione di Origine Controllata in Italy. 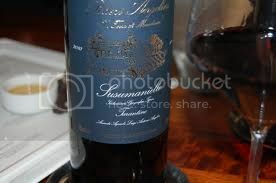 This wine is produced in several D.O.C´s in Veneto. It is one of my favorites. 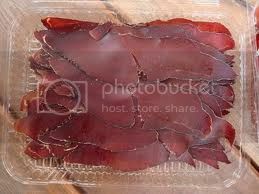 Proscuitto di Chamois = a ham from a small mountain goat which looks like a small antelope. 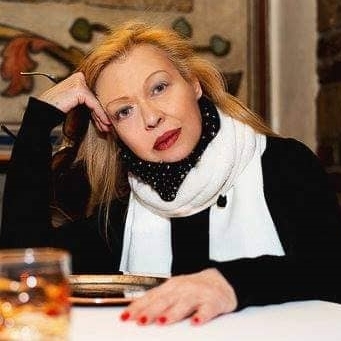 Fonduta = Similar to a Swiss or French Swiss fondue, however, made with: Italian Fontina cheese, milk, butter, garlic, egg yolks and white pepper instead of Gruyère and Kirsch cherry brandy. 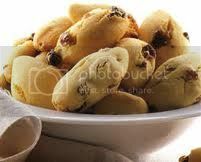 Zaleti = a corn flour muffin type pastry filled with raisins, Grappa, butter, sugar, vanilla, corn and wheat flour. Zuppe di Cozze = a seafood and shellfish soup with mussels ( cozze ), fish, clams, fish stock, white wine, olive oil and garlic. Trentino Alto Adige: Is this Italia or Austria ? 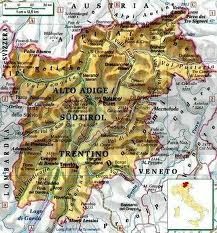 it is both ... Trentino Alto Adige were connected in 1948 into one region. However, both had belonged to Austro Hungarian Empire known as Südtriol which is called South Tyrol in English until 1919 and when they were given to the young nation of Italia in return for supporting the Allies during WWI. The cuisine of Trentino is a merger of the two cuisines, for example: their crêpes filled with fruit, gulasch and knöden which are bread dumplings are the Austrian link. Stragolapreti = Spinach Meatballs. The ingredients of this clerical historical Alto Adige ( Preti is Priest in English ) recipe are: day old bread, spinach leaves, eggs, milk, flour, salt, black pepper, nutmeg, butter, sage, Reggiano Parmesan. As you can see, due to the Clerical aspect of this dish, ground pork or ground beef or the combination had been eliminated, however, one can add ground meat certainly. Fritelle Di Mele = Apple Doughnut. 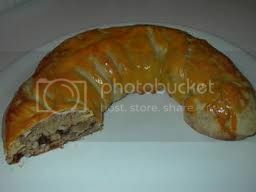 This is one of most popular pastries of the Austrian infused region. 1) Lagrein: oak aged reds with a D.O.C. 2) Vernatsch: Wines of elevated market quality. 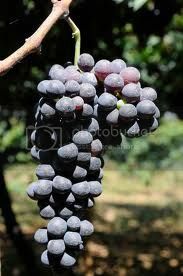 3) Sudtiroler: Pinot Nero, a black grape Designation of Origin. This Pinot Black Grape originated in france and furthermore, the Vitners are improving harvest and all oenological sectors, including Burgundy production. They have been producing oak age wines for over 100 years in this zone. 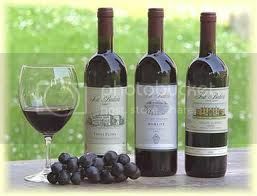 There have been numerous upgrades, investigation on indigenious grapes and improvement in production and of course, quality. ** to be worked on daily. Thanks for a very informative post Margi...I'm sure it will be a help to all the members who are unaware of most of the Italian terminology. I wouldn't mind seeing a post like this in all the different country forums that we can. Thanks alot for your support and compliments ... As mentioned previously, I speak 5 1/2 ... so, this is a long term project 2012 as you can see Plus the Herbs and Cheeses I am working on ... I am off to Italia ! ( not physically ) ... to work on the glossary for a little while ... Note: I have already kicked off Mexico and South American and Hispanic Caribe ... They are in the corresponding sections. thank you, margi ~ this is going to be a very helpful addition to our forum! I'll be adding some photos for you Margi, as time allows. All my best and thanks again for all your support, collaboration, backing, creativity and input that you give all your members and writers. Thank you very much for the lovely compliment .. Unfortunately, we lost all the Photographs due to the new & greedy regulations of Photo Bucket and the photographs need to be replaced ..
Hopefully we can work on this lengthy Project during the summer time .. Welcome to Fotw .. Really wonderful to see a Dear friend here ..